The first stage is the part that is much brighter than tritium. The 1st stage lasts from an hour and half down to 30 minutes depending on the light source used and how long the exposure was. As you can see, the difference in the stages comes between the 1 and 2 hour marks. 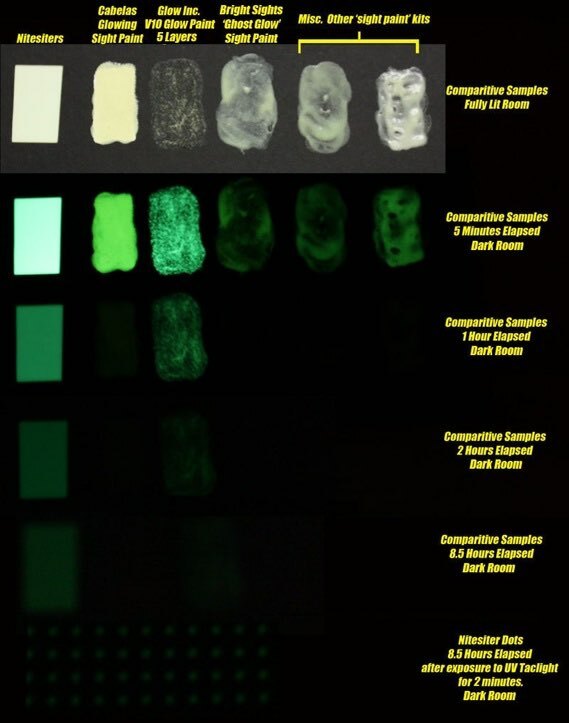 Notice how the glow is softer but still very visible. The second stage starts as time passes. The bright glow fades but is still easily visible and becomes more reliant on your eyes being adjusted to the dark. For example I usually have my gun on my bedside table charging under my table lamp for a few minutes before I head to bed. When I wake up at 6 am, I can look over and see Nitesiters VERY easily. If I were to go into a brightly lit room and then come back into the dark to view Nitesiters, I probably wouldn’t see them glowing at that point because my eyes wouldn’t be adjusted to the dark very well. In this photo you see Nitesiters glowing for 8.5 hours. I'm comparing Nitesiters to all the competitors products. Glow Inc, and Cabelas Sight Paint Kits were the closest, but still don’t hold a candle to brightness and long glow times of Nitesiters. As you can see, Nitesiters are the best! by some of the competition. The reality is... that there IS no competition!